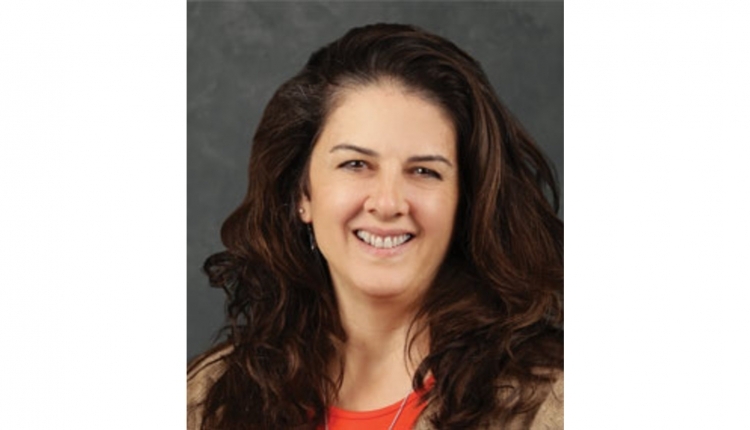 The author is a dairy economist with Downes-O'Neill/FC Stone, LLC, Dearborn, Mo. There was generally good news for U.S. dairy producers with the release of USDA's World Agricultural Supply and Demand Estimates (WASDE) report on February 10. On the input side, feed costs are going to be lower in 2014 than they were last year. That's refreshing because it has been a few years since dairy producers started the year off looking at lower feed prices. On the other side of the equation, the U.S. All-Milk price midpoint is projected to be $21.20 per hundredweight, up $1.19 from 2013's price level. If realized, the 2014 All-Milk price would be the highest in history . . . $1.06 ahead of the previous 2011 record set at $20.14. 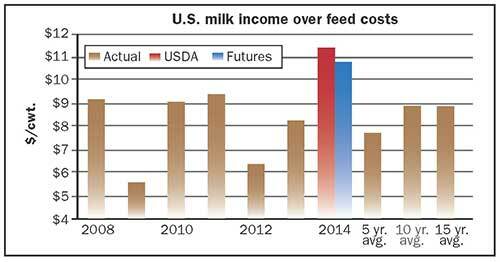 The gain in milk prices combined with the reduction in feed costs will push income over feed costs for dairy producers up from the levels recorded the past six years. That would make it the second highest recorded behind 2007. Futures prices are less optimistic than USDA when it comes to dairy producer profitability but have risen substantially since the beginning of the year with milk prices outpacing input costs. Using USDA's marketing year midpoint projections for corn and soybeans, plus my rough estimate for alfalfa hay, the 2014 feed costs are projected to be $9.76 per hundredweight. 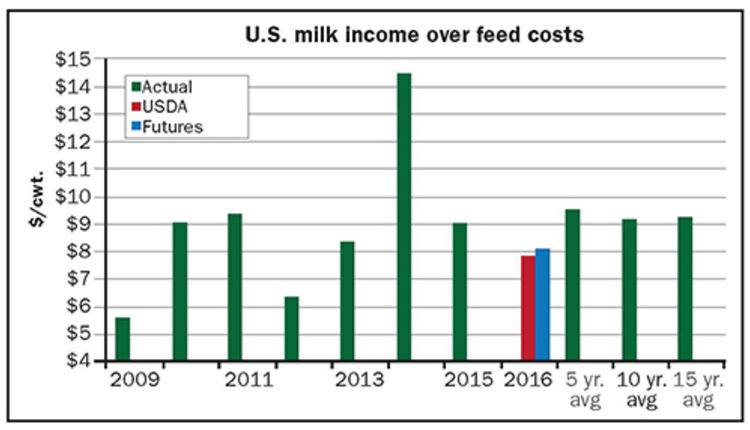 When USDA's feed costs are combined with its calendar year All-Milk midpoint price projection of $21.20, income over feed comes in at $11.44 per hundredweight. That is $3.15 above 2013's level of $8.29 and $3.70 higher than the five-year average of $7.74 per hundredweight. Looking at another source for prices, the futures market, a higher result is expected. 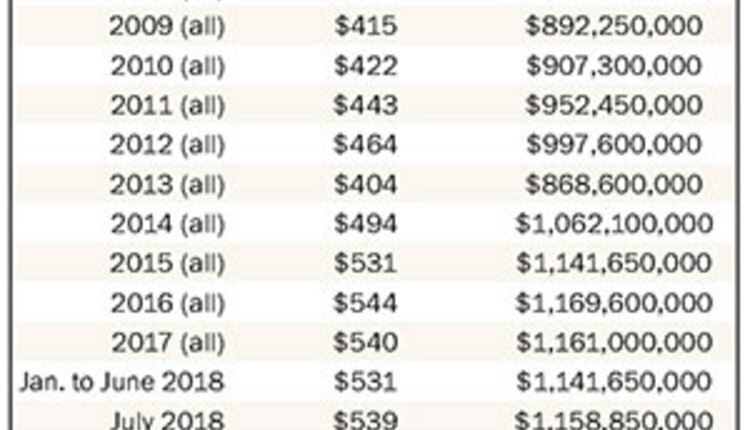 Using the February 10 futures settling prices for corn and soybeans, plus my rough estimate for alfalfa hay, the 2014 feed costs are projected to be $9.73 per hundredweight (cwt.). When USDA's $2.50 per cwt. difference between its 2014 All-Milk and Class III milk price estimates are added to the February 10 Class III settling futures prices of $19.25, the resulting All-Milk price projection is $21.75. The resulting futures based income over feed comes in at $10.84 per cwt. That is $2.55 above 2013's level and $3.10 higher than the five-year average of $7.74 per hundredweight (see figure). With income over feed costs estimated to be above average, gains in milk production should also be higher than average . . . given average weather. That is exactly what USDA is estimating with their projected milk production estimate of 205.7 billion pounds, a gain of 2.2 percent over 2013's record production. The gain in milk production will probably not start occurring in earnest until the second or third quarter of 2014. This later-year milk projection is due to the lack of strong milk per cow that seems to be the result of less than ideal forage quality. Colder and snowier weather than normal across a large part of the country is also not helping dairy cows achieve their maximum potential. The timing will also be helped by a decent number of dairy heifers entering the herd this year. Dairy heifers expected to calve in 2014 are pegged at their third-highest level since USDA started to track the category in 2001 at over 2.9 million head. Even though the inventory level for 2014 is still high, below-average profitability in the first eight months of 2013 combined with high beef prices were enough to cause dairy producers to reduce the overall number of replacements and milking cows for 2013. According to USDA's Cattle Report for January 1, 2014, the supply of dairy replacement heifers has fallen since January 1, 2013. Dairy replacement heifers over 500 pounds are estimated to number 4.54 million head, down 0.25 percent from 2013. Of the 4.54 million head of replacement heifers, 2.98 million are expected to calve in 2014. 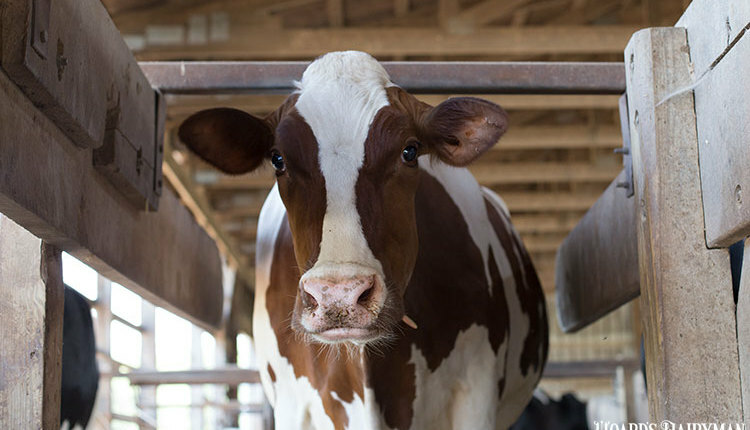 This is 65.7 percent of the total replacement heifer inventory and 32.4 percent of the milk herd, the fourth-highest level since the data series started in 2001. For milk cows that have calved, USDA-NASS estimates the herd size to be 9.21 million head, down 0.1 percent from 2013. Last year's milk herd dropped 2,000 head to 9.22 million head. With the milk herd down less than replacement heifers, the percentage of replacement heifers to milk cows dropped in 2014 compared to 2013. The 2014 percentage of heifers to milk cows is 49.3 percent. 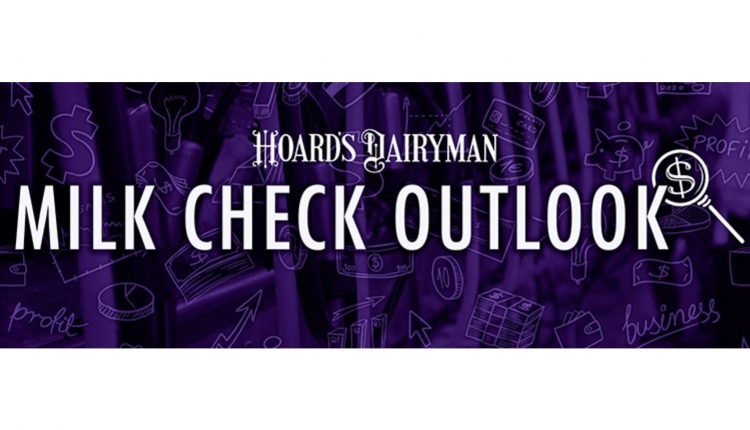 While the 2014 outlook for dairy looks good, producers are also well-positioned to take advantage of higher beef prices while maintaining milk production levels due to the large number of replacements relative to the overall dairy cow herd. Additionally, U.S. economic growth seems to continue to be accelerating in fits and starts. But there is enough forward movement for the Federal Reserve to start paring back bond purchases. The growth will help dairy demand, but it is probably not strong enough to offset the higher outlays for energy that consumers are incurring due to colder-than-normal temperatures affecting a large part of the country. The growth still has about the same air of fragility as last month. While some uncertainty has been removed from the market, other areas have been brought to the forefront. As a result, the impact on domestic dairy demand will probably return to the uneven pattern that was prevalent during most of 2013. Holiday demand was very strong, but the concern is that it will fall dramatically in the first quarter of 2014 as consumers recuperate from the year-end festivities. 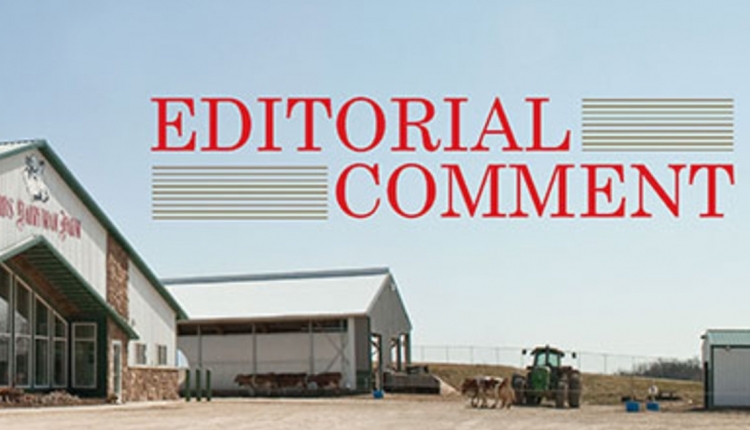 The concern is that falling demand combined with less-than-competitive prices in the world market could cause a backup of dairy commodities in U.S. warehouses. Gasoline prices have been stable to lower over the past weeks as traders view the economic situation a little less positively than last month. There has not been any real international crisis over the past month, but some countries are starting to make rumblings about the implication of falling currencies relative to the U.S. dollar and that has taken away a potential source of upward momentum. Congress did come to an agreement on a framework for federal spending bills and passed a farm bill that will provide some certainty to at least the rural economy. The hangover from end-of-year spending and less-than-ideal weather in January has caused consumers to pare back spending, and it is not a given that it will end soon even with most expecting better times in 2014. This article appears on page 164 of the March 10, 2014 issue of Hoard's Dairyman.